For most of the 19th and 20th centuries New Zealanders were happy to buy food from shops and street hawkers. But in the wake of the large supermarket chains, people have discovered regional foods, and the pleasures of shopping at markets and buying fresh produce directly from growers. Early markets in New Zealand were makeshift affairs. Māori sailed to settlements in large waka (canoes) and set up on wharves or close to towns. In Auckland, the chief Taraia would arrive once or twice a year with a fleet of 40 canoes and sell pigs, potatoes, wheat, maize, melons, grapes, pumpkins, onions, flax, turkeys, geese, ducks, chickens and firewood. As towns and cities were established, land was often set aside for a local market, and some market halls were built, but none of them flourished. People were happy to buy food from local shops, or from sellers who hawked food door to door. Most communities had their local greengrocer, butcher, fish shop and grocer. Farmers and growers sold their produce at auction to wholesale buyers, who sold them on to shops and for export. This was a departure from the practice in Britain – there markets where people bought food from farmers were common. Turners and Growers was set up in 1921 and in the early 2000s was still the biggest produce wholesaler. It was formed when Turner auctioneers offered growers shares in their company. From the 1970s large open-air markets were formed, often by charity groups. Stalls sold bric-a-brac, second-hand goods and handmade crafts as well as food. In Auckland, the Ōtara market set up by Te Puke Ōtara marae in a car park in 1978, had a strong Polynesian influence, including stalls with Pacific Islands foods. Another market began at Avondale and featured Asian foods. 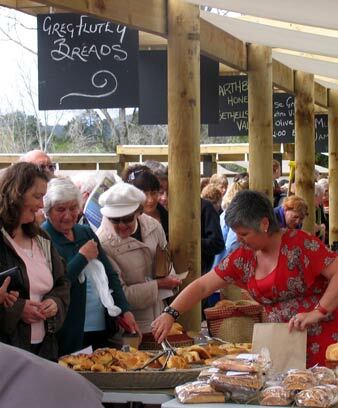 Farmers’ markets began in Whāngārei in 1997, and by the early 2000s most New Zealand cities had a market selling fresh local produce. People travel to farmers’ markets to buy food from the people who grow it. They can sample food before they buy and dine outside. Farmers’ Markets New Zealand was established in 2006, and requires farmers’ markets to sell at least 80% of produce which is locally grown. This is unlike supermarkets, which procure food available in quantity and cheaply priced, no matter where it is grown.